This is one of my favourite dinners of all time. We only recently discovered the delights of baked camembert which is why I try to make up for lost time by making it as often as possible! I was searching for cheese fondue recipes and instead came across this super easy faux fondue. 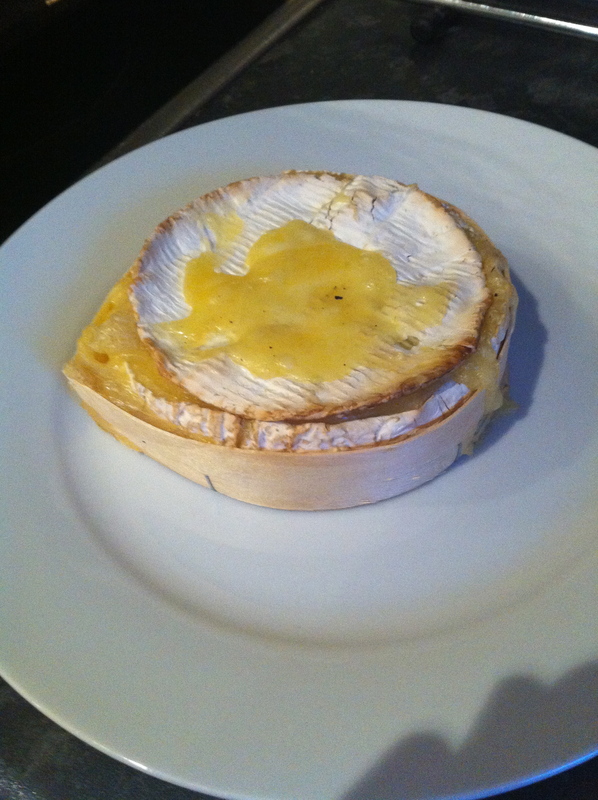 We just use a cheap Sainsburys whole camembert as we are far from cheese connoisseurs, but I’m sure if you used an expensive cheese it would taste very very good as well! I tried to get an ‘innards’ shot! To make the camembert all nice and flavourful, I first carefully slice the top rind off and set it aside (don’t throw it away because it’s going back on!). I cut a garlic clove into thin slices and stuck them into the soft inner cheese, along with salt, pepper, a drizzle of olive oil and the top slice of rind. The cheese bakes in it’s box for about half an hour in a hot oven. When I took it out it smelt AMAZING and all the inside had fully melted, engulfing the now soft garlic slices and transforming the hard cheese into a gooey dip. To accompany the camembert we usually choose a selection of goodies to dip in and top the lovely fresh bread we buy. 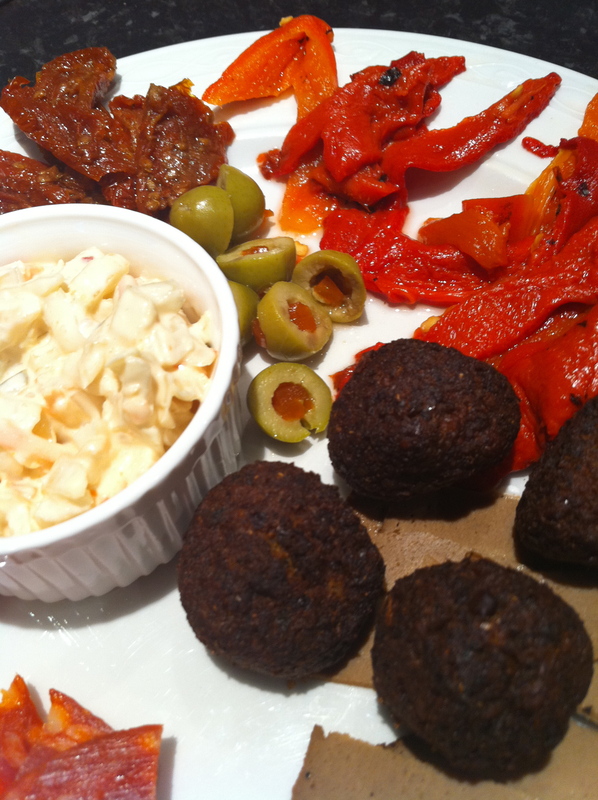 On this occasion we have (clockwise, from top) roasted red peppers, falafal, Quorn roast beef slices (remember our Royal Wedding party platter?) 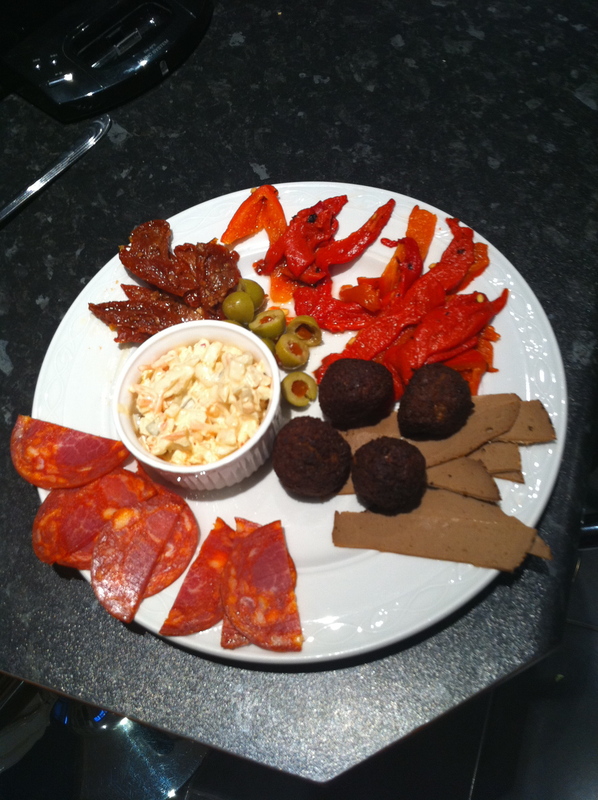 sliced chorizo, coleslaw and sundried tomatoes. Seems like a bit of a medley but trust me, it works! 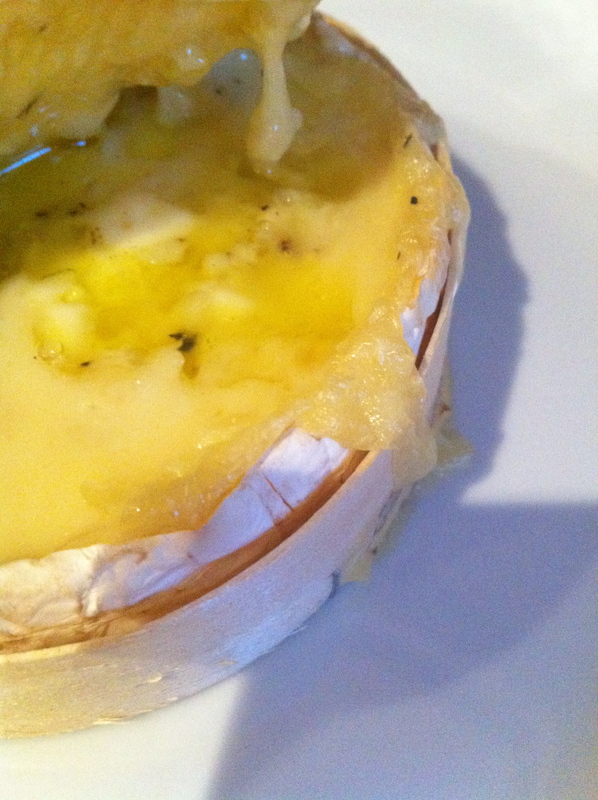 Although, to be honest, is there any food that wouldn’t be improved by a smothering of ooey, gooey, garlicky melted camembert?